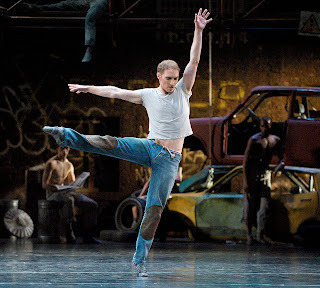 This meeting came about because Principal Thiago Soares had been indisposed since last weekend’s Nureyev gala, and in order for the second cast to have their stage rehearsal, they wanted Bennet to take Thiago’s role. Stage rehearsals are significant because it’s the dancers’ first chance to perform with the orchestra, the sets and the costumes, in the theatre setting, which is a very different place from the studio. There is also an audience, albeit one aware that it’s a rehearsal and not a performance. He also explained that his motivation for starting the week was “that I’m in control of my own future.” Within the company, though, his future is decided by a combination of the Artistic Director (currently Monica Mason) and the misfortunes of his colleagues (and the reverse is also true). Which brings us back to the general rehearsal, and these vivid images captured by photographer Elliott Franks. Bennet had spent time in the studio watching Irek Mukhamedov coaching Carlos and Thiago. Both of them also had private calls to rehearse the pas de deux, and Bennet stood in the studio without a partner “I didn’t have a girl to cover because one of the girls that was covering it wasn’t there because she was working too heavily on other things. So I used to just stand and watch it and take in what I could take in”. 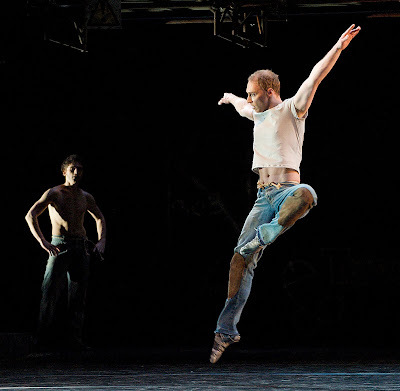 After completing the rehearsal, Bennet had to prepare to dance the Peter role for the evening performance, which was being filmed. This story is tinged with a sadness though. At the beginning I talked about being in a company and how that works for you and sometimes against you. The good news is that Thiago is back; for Bennet that means his hard work won’t come to fruition in terms of a performance. But this is an extra bittersweet tale because while you are, to an extent, at the mercy of the Artistic Director and of fortune, as a dancer the clock is also always ticking furiously and this may have been Bennet’s last opportunity to dance a role he covets. The triple bill of Concerto|The Judas Tree|Elite Syncopations is currently in rep until 15th April at The Royal Opera House. Please take note of the warning on the booking page. You've probably got the idea from these photographs. Lovely article Elise. I was at the rehersal and thought Bennet did brilliantly ! thnx for your comment i love ur post too! And the photos are amazing!! I just can't get enough looking at these performance images. They're beautiful! Those are great images! Your blog always inspires me to want to see a ballet. Have a great weekend! Whenever I visit your blog it gives me such a big envy to go and see ballet plays or I don't know just watch on youtube videos! Your blog has so many wonderful images! I love it! Many thanks for sharing these fabulous photos with us. How I wish I could see the performance! I do love ballet but have always been a student admirer. I never could remember the combinations! grrr... therefore I watch dance and enjoy it immensely. Also, thanks for commenting on my blog! I have to follow yours now to see your upcoming ballet news and photos as they are so beautiful and I can admire from afar! Wow. That looks like an amazing production. Thank you for coming by and saying hi...these images amaze me...the talent and strength of all these dances. xo Have a great new week. What a great guy. Saying things like doing things to be in 'control of my own future' also appeal to non-dancers like me (not to mention the dancing with his wife wish). The pictures show perfectly the joy and the immense work that goes into dancing! Great article! looks amazing!! Hope you are having a nice week! Have a great day! Anna - thank you ! Anon - thank you for your lovely comment. I think I've said before that one of the reasons I started writing online is that I can give space to all manner of ballet-related topics as well as featuing the dancers that I feel have interesting things to say. Very glad to hear that you are enjoying it ! Simply Colette - thank you. I hope that you have been to see something ? Vintage Me New You - thank you so much ! Lisa Marie Olson - the costumes are always made with movement in mind; some to a greater extent than others. Depends on the ballet really. naomemandeflores - thank you ! ByLightOfMoon - nothing wrong with enjoying watching a ballet rather than dancing - it's the involvement that's key. Good for you ! beedeebabee♥ - yes, I think you've captured it exactly right.. The girl with the flour in her hair - thank you ! Iva - thank you, you too ! You have the most awesome blog. Finally, someone who posts BIG photos with good resolution. Royal Ballet Principal Sarah Lamb @ MOVE IT!